Modern sports fans take for granted that a champion will be crowned at the end of each season. But in baseball in the 1860s, the nominal championship changed hands in the same way in which modern boxing crowns are transferred: when a challenger unseated the titleholder in direct competition. The one difference back then was that the champ had to lose a “home and home series” (or two out of three games, if necessary). These series were usually played over the course of several weeks with other games interspersed. In this manner the “championship” was passed among the Atlantics of Brooklyn, the Unions of Morrisania, the Mutuals of New York, and the Eckfords of Brooklyn from 1867 through 1869. All of these titular champs were from the New York City area, and through artful scheduling they managed to avoid putting the title on the line against other clubs. Even the undefeated 1869 Red Stockings of Cincinnati were denied a chance to hold the title. A new contender, the Chicago White Stockings, had entered the professional arena in 1870, with a high-salaried squad dubbed “The $18,000 Nine.” After a somewhat disappointing start, the club began to win regularly. They won their first meeting with the mighty Red Stockings on September 7, having already defeated the current champion Atlantics, and headed east with a chance to claim the championship pennant. Cynics in Chicago declared that “while Chicago may play better baseball, New York can play other games better,”1 and predicted that the Mutuals would be allowed to win the Atlantics’ title before the Chicago club arrived. Sure enough, the Mutes beat the Atlantics on September 15, and although Chicago swept its four games versus the Eckford, Mutual, Atlantic, and Athletic clubs, the team returned home frustrated. But in order to strengthen their dubious championship claim, the newly crowned Mutuals scheduled a trip to Chicago and Cincinnati, giving the White Stockings another chance. The Chicago game was played on an unseasonably warm November 1. The Mutuals picked Tom Foley as umpire from among the locals available. Although all the runs were aided by walks and errors, the game was relatively well-played and went into the eventful ninth inning with Chicago leading 7–5. But they had not counted upon a determined foe backed by a partisan umpire. Up to this point the White Stockings had been given seven bases on balls, as opposed to none for the Mutuals. Now the Chicago batsmen simply refused to swing at pitches, relying on umpire Foley to give them their bases. Clipper Flynn led off, waited patiently, and was awarded his base on balls, much to pitcher Rynie Wolters’ irritation. The next two batters were also awarded first base “on very questionable called balls.”3 With the bases now loaded, Ed Pinkham surprised Wolters by swinging and lining a hit to left-center, sending two men home. Ed Duffy came through with a fair foul over third base that plated another. Pinkham and Duffy tried a double steal, and a wild throw allowed one man to score and the other to reach third. Duffy soon crossed the plate after a passed ball. The score was now 13–12, with the crowd roaring for more. Bub McAtee stood at the plate like a statue and refused to offer at any pitches. Having already appealed to the umpire, Wolters stopped and asked McAtee where he wanted the ball, all to no avail. After more than a dozen pitches, Wolters threw down the ball and refused to allow the farce to continue any further. 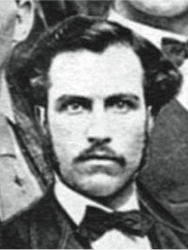 Mutual captain Charles Mills called his men in and, despite all appeals, would not continue. 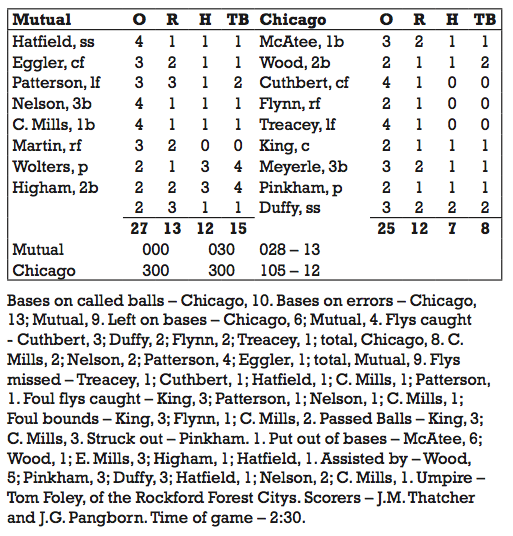 The sun was setting, the excited crowd broke onto the field, and umpire Foley called the game, not as a 9–0 forfeit but as a 7–5 Chicago victory through the last completed inning. 1. Orem, Preston D. Baseball (1845-1882) From the Newspaper Accounts (Altadena, 1961), p. 118. 2. Chicago Tribune, November 2, 1870. 3. New York Clipper, November 12, 1870.